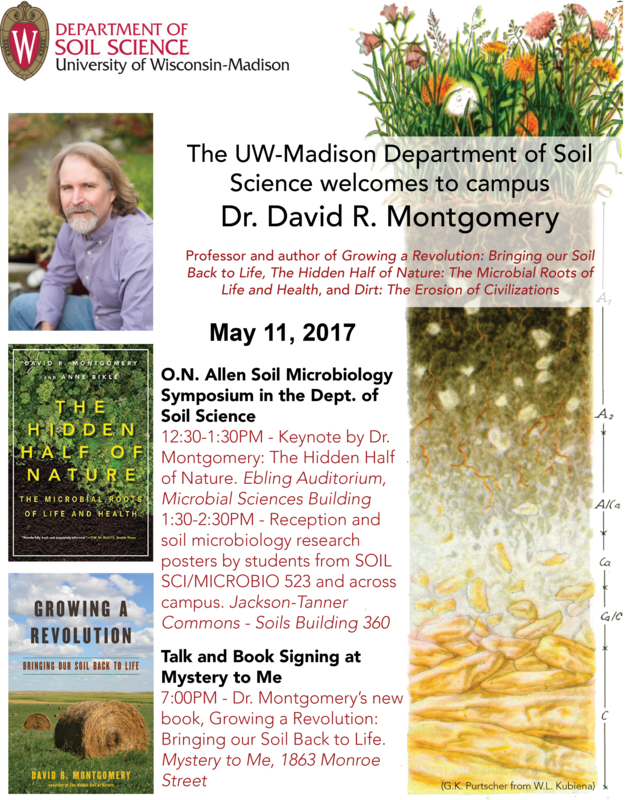 The UW-Madison Department of Soil Science is pleased to welcome David Montgomery, professor at U Washington, and author of Dirt: Erosion of Civilizations, The Hidden Half of Nature: The Microbial Roots of Life and Health, and Growing a Revolution: Bringing our Soil back to Life. As part of my current professorship, we are bringing Dr. Montgomery to campus as our student-nominated speaker for the end-of-year symposium in my Soil Microbiology course (SOIL SCI / MICROBIO 523). This symposium will take place May 11 at 12:30, in the Ebling Auditorium in the Microbial Sciences Building. After the talk, there will be a reception at 1:30 in the Jackson-Tanner Commons in the Soil Science building, where students will present their end-of-year soil microbiology group project posters. That evening, at 7PM, he will hold a reading and book signing at Mystery to Me on 1863 Monroe St.